The concept of 'universals' is even more apparent in the geometric symbols - as opposed to the 'figurative' - of prehistoric art. 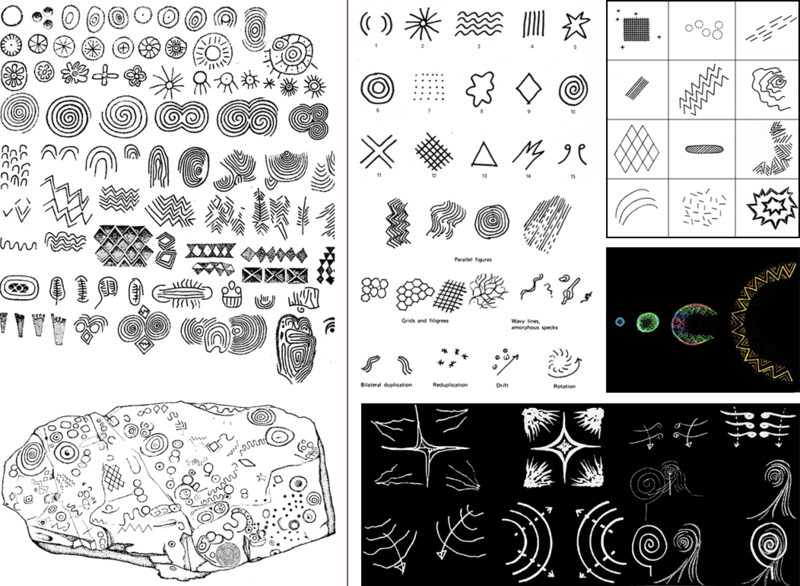 Geometric signs are found at nearly all decorated Upper Palaeolithic sites in Western Europe. Indeed, they are found throughout the world, but the meanings they hold remain elusive. 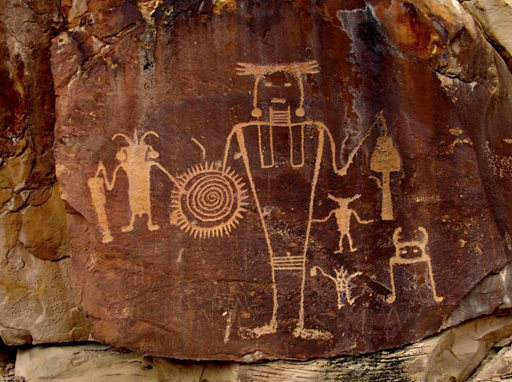 Some symbols may have been stylized from mundane images of everyday life - tools, weapons, housing - and some may have been truly abstract shapes which could very well be symbolic representations of important concepts and ideas, or the manifestations of transcendent, shamanistic experiences in the form of visual hallucinations. 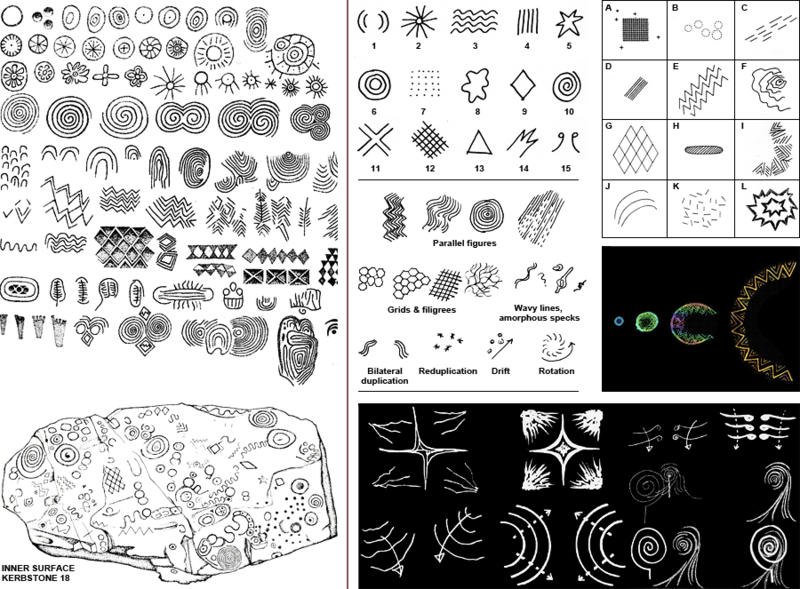 We do not yet know the precise meanings of these symbols, but perhaps there is a way - a hypothesis - to begin to explain their universality across time and location: geometric forms seen in prehistoric rock art emerge from the anatomical and neurophysiological characteristics of the human visual cortex. Let us explore whether these symbols are universal, and whether they emerge from some aspect of the structure or function of the human mind that has not changed fundamentally across all of this time and dispersion throughout the world. By looking at the neurological origin of the symbols, we cannot shed light on the symbolic significance of the geometrical images. In fact, these meanings will vary, we assume, from culture to culture. A deeper understanding of meaning is beyond the realms of this hypothesis. One of the most common geometric motifs is the spiral, painted and carved throughout the world. And yet the symbolic meaning of the spiral in prehistoric art is speculative. Some argue it may have represented the sun, or the portal to a spirit world. Perhaps it represented life itself, or life beyond life - eternity. Or else, it may have had a more prosaic, functional purpose, that of a calendrical device, employed to deconstruct time into chapters, seasons and solstices. 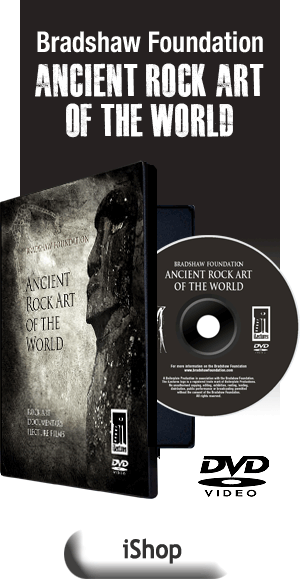 From the painted and engraved walls of the Upper Palaeolithic to the decorated megalithic standing stones of the Neolithic, the symbols persisted. 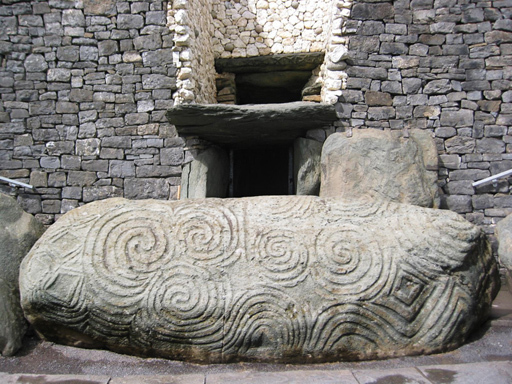 In Europe, the megalithic art of Ireland featured the spiral intensively. 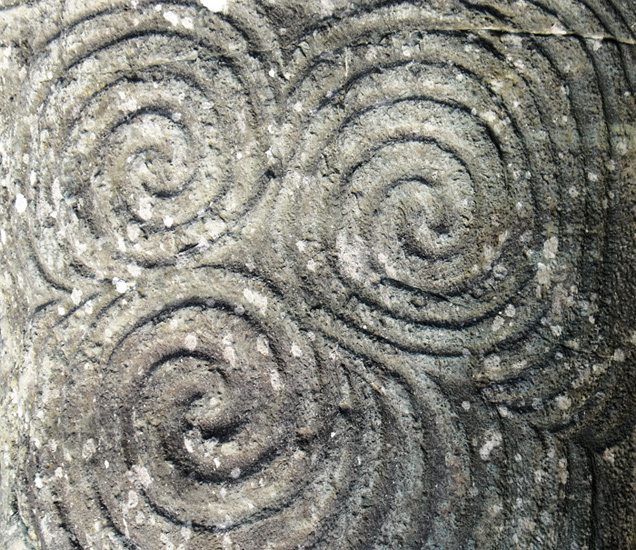 At Brú na Bóinne, a significant center of human activity for almost 6,000 years, the spiral symbol is a dominant feature. The site is a complex of Neolithic mounds, chamber tombs, standing stones, henges and other prehistoric enclosures. The major sites within Brú na Bóinne are the impressive passage graves of Newgrange, Knowth and Dowth, each standing on a ridge within the river bend. 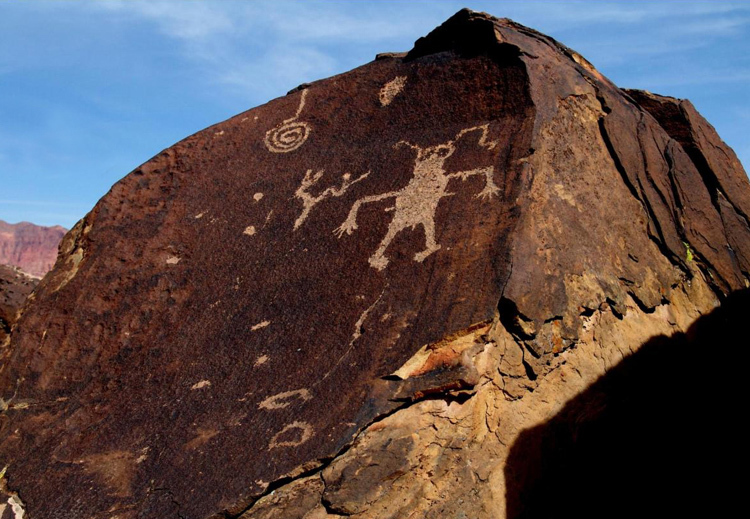 Each of the three main megalith sites have significant archaeoastronomical significance. It is thought that Newgrange and Dowth have winter solstice solar alignments, and Knowth has an equinox solar alignment. Knowth is the largest of all passage graves situated within the Brú na Bóinne complex. 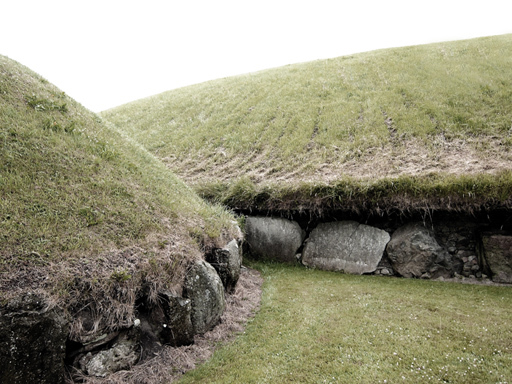 The site consists of one large mound and 17 smaller satellite tombs. The large mound is roughly 12 metres in height and 70 metres in diameter. It contains two passages, placed along an east-west line. The passages are independent of each other, and each leads to a ceremonial chamber. The mound is encircled by 127 kerbstones. The kerbstones, large blocks of decorated stone, are adorned with geometric patterns, including spirals. 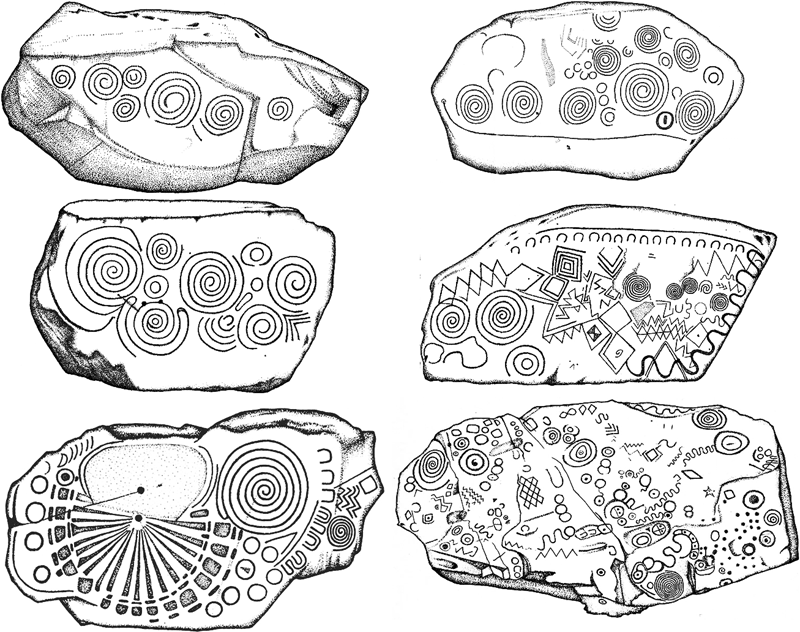 The patterns on several stones (not shown here) have been interpreted as calendrical devices that enable the calculation of the synodic and siderial months and the exact length of the year. They suggest an awareness of a 19-year lunar cycle. Spiral symbols that were probably not related to any calendrical functions occur on two artifacts created at totally different scales of construction, at widely separated locations and times. 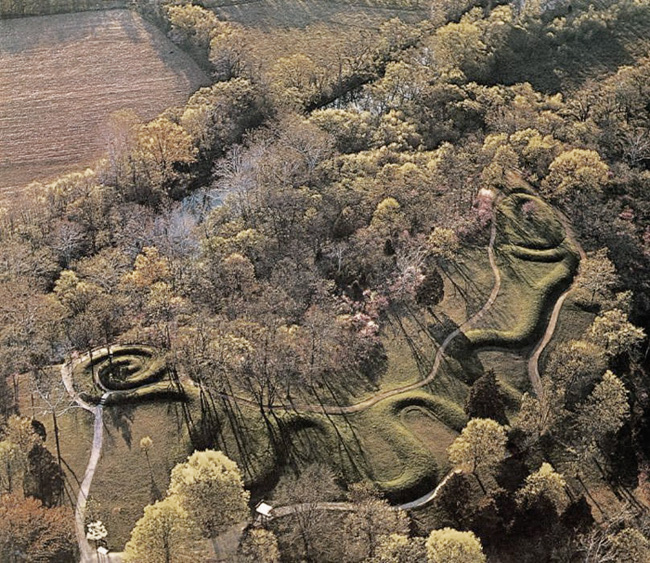 At the grand scale is the 2,000 year old Serpent Mound in Ohio, North America. 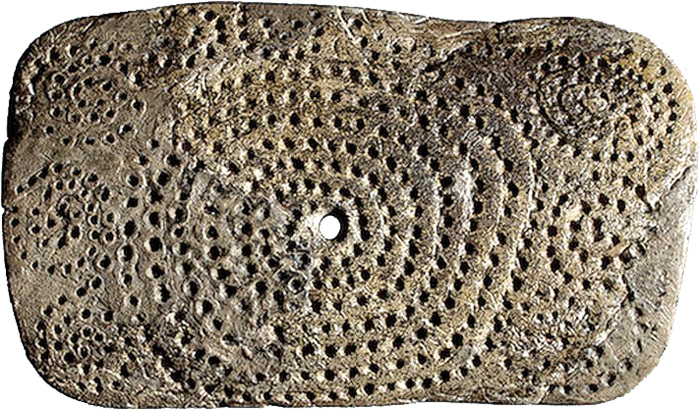 At a much finer scale is the 18,000 year old spiral-engraved mammoth ivory piece, discovered in Siberia at Mal'ta to the west of Lake Baikal. If not calendrical devices, what were the symbolic significance of these spirals? 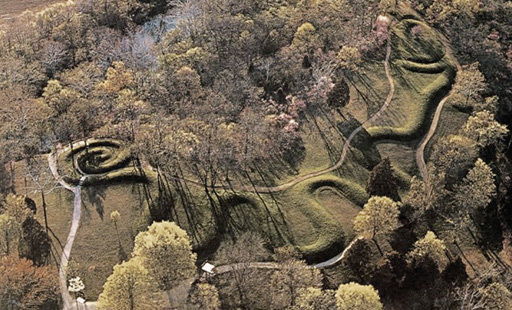 Even though the meanings may never be known with certainty, their forms may have emerged from the same neurological wellspring as the megalithic spirals in Ireland. 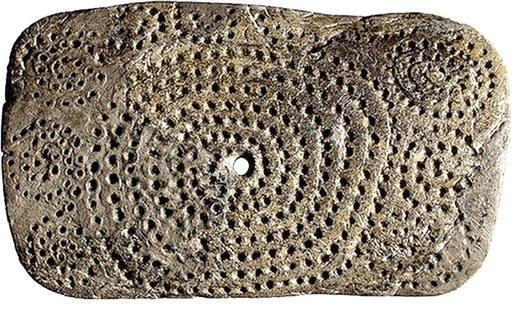 It is worth noting that other than the portable mammoth ivory piece, the spiral motif is rare in European rock art sites from the Upper Palaeolithic [approximately 40,000 to 12,000 years ago]. According to Genevieve von Petzinger, it is strange that it is not present more often considering that it is a very common entoptic shape reported in trances, and how central this motif becomes in later time periods. To her this lack of spirals in the Upper Palaeolithic raises some very interesting questions about where people were getting their inspiration for the non-figurative art (possibly altered states of consciousness were not a regular phenomenon yet) as well as the choices they were making about what to depict or leave out. 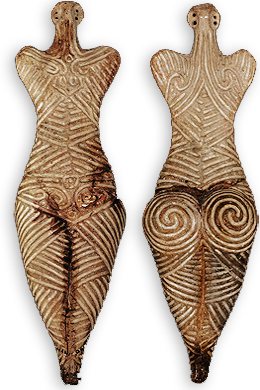 The use of the spiral does not become a regular occurrence in Europe until after the Upper Palaeolithic and that the mystery of why not still remains to be solved. In the Americas, however, the spiral symbols were not rare. 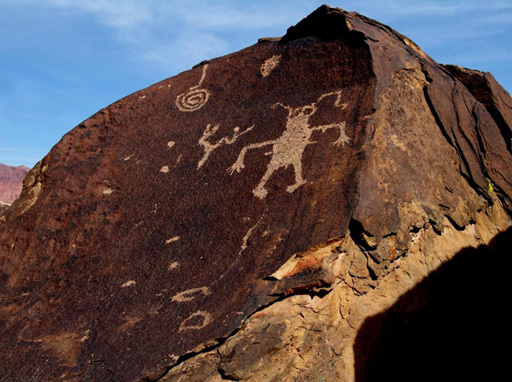 They are infact very prevalent in the rock art during a period that was culturally equivalent to Europe's Upper Palaeolithic. 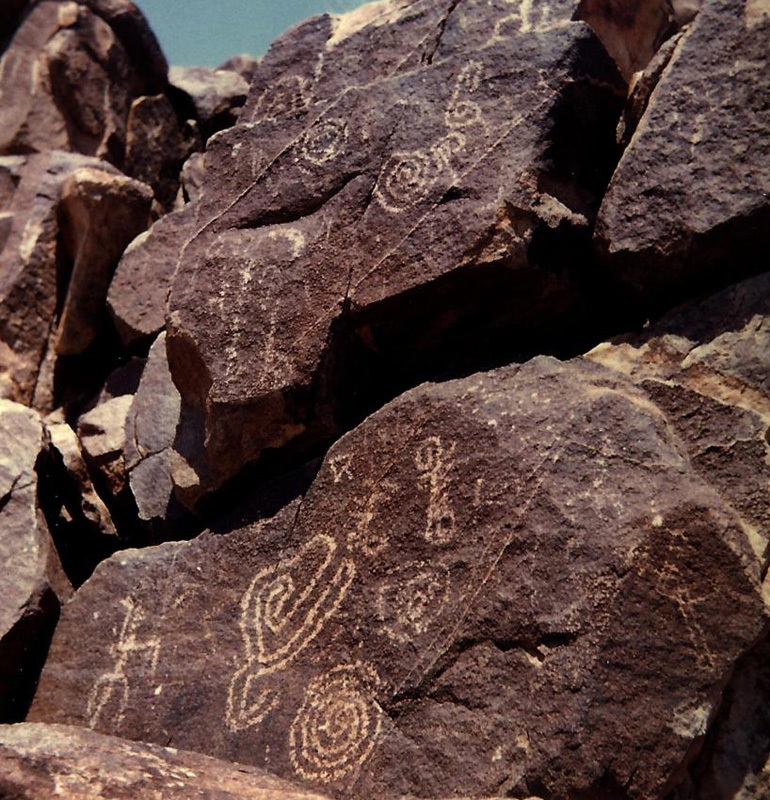 Many of the sites in the Americas where spirals are prevalent are thought to be associated with cultural use of hallucinogenic drugs or rituals. The ubiquitous nature of geometric motifs, such as the spiral, clearly raises the question: What is the art saying? It also raises another question: What relationship do geometric motifs have with the human nervous system, with hallucinations, for example? 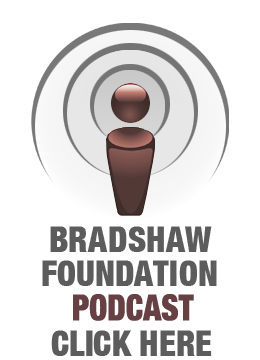 We need to understand the relationship between brain, vision and interpretation. What is the cortical basis for geometrical visual hallucinations? What causes these geometric patterns [and even more complex patterns] to be generated in the cortex? The scientific literature has a host of images drawn by people during or directly after they were experiencing hallucinations induced by drugs, or direct electrical stimulation of the visual cortex of the brain. One can argue that there is a clear commonality between hallucinations and prehistoric geometric motifs, such as the kerbstones at Brú na Bóinne.